Managed Security Services or MSS are considered as the systematic approach to managing an organization’s security needs. This is needed for better security against security contravention and cyber-attacks. Conducted both in-house and outsourced to service provider, this security service oversees other companies’ information system security and network. Main functions of managed security services are overseeing patch management and upgrades, responding to emergencies, round-the-clock monitoring and management of intrusion detection systems and firewalls and performing security audits and assessments. Outsourcing security operations to managed security service providers having core expertise and skilled workforce can improve the quality of protection of managed security services. Major factors that drive the growth of managed security services market are rise in digital information generation and increasing trend of being your own devices(BYOD), along with the need to secure it. Due to the rise in complexity and frequency of security breaches and cyber-attacks, organizations are increasingly deploying managed security service providers. This is done to monitor and provide better protection. 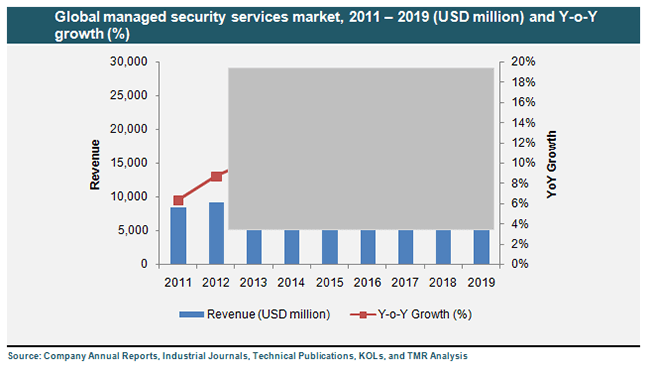 The global managed security services market is estimated to witness a strong growth at 15.4% CAGR during the forecast period of 2013 to 2019. By the end of the forecast period the market is predicted to be valued at US$24.12 bn. Based on applications, the global managed security market is segmented into risk assessment, confidentiality, compliance, business continuity, access control, and network security managed security services market. Among these, confidentiality market, compliance services and network security services collectively account for leading share in the market for managed security services. On the basis of delivery, there is consumer premise equipment (CPE)-based services, cloud-based or hosted-based services, global managed security services, and hybrid services, which is an integration of cloud-based and CPE-based services. The emergence of cloud-based managed security services is likely to boost the global market significantly over the forecast period due to easy installation and low maintenance cost as compared to others. Based on industry verticals, the global managed security service market is segmented into telecom and IT, retail, healthcare, hospitality sectors, manufacturing, government and utilities, research and development (R and D), and banking financial services and insurance (BFSI). The report states the leading end users like the government utility sectors, telecom and IT and the BFSI account for a large share. Outsourcing proves to be a viable and economical option because of the rise in numbers, cost pressure compliance, lack of internal expertise, and complexity of threats. The global managed security services market is studied on the basis of key geographies Asia Pacific, Europe, North America and the Rest of the World. Due to the benefits that managed marketing services offer, there is rise in awareness, and this has fueled the market globally. However, consumers are hesitant to share confidential information and this may restrain the growth of managed security services market in the years to come. North America has been leading the regional market and is predicted to continue its dominance over the forecast period. However, Asia Pacific is estimated to grow at a rapid pace during the forecast period. As a part of their product portfolio and services expansion, a majority of internet/telecom service providers have started to venture in managed security services. IT companies and Companies like IBM Corp., AT&T Inc., Bell Canada Inc., Wipro Technology Services Ltd., and Tata Communications Ltd. are some of the key participants in the global market for managed security services. The key players estimated to dominate the market are Dell Secure Works, IBM, EMC, and HP. Managed security services are network security services which are outsourced to perform various functions including management of intrusion detection systems and firewalls and round-the-clock monitoring. Due to rising frequency and complexity of attacks, most organizations are increasingly deploying add-on solutions and modules to their existing network security solutions, which in turn increase the complexity of security networks. Hence, organizations are outsourcing their network security to managed security services providers (MSSPs) who have proficiency (in terms of skilled workforce and dedicated tools and systems) in managing complicated security networks. MSSPs offer various types of security services such as network boundary protection, intrusion detection and prevention for networks and hosts, event log management and alerting, anti-virus and web content filtering services, patch management and security software management, data leak prevention, secure messaging, and information security consulting services, among others. The report includes segmentation of managed security services by industry vertical, applications, mode of delivery and geography. Further, it provides current and forecast market size by revenue for the aforementioned categories. Cross sectional analysis for industry vertical, application, mode of delivery and geography segments is also a part of the scope. Factors influencing and inhibiting growth of the market have been analyzed. The market overview section of the report demonstrates the market dynamics such as drivers, restraints and opportunities that influence the current status and future status of the market. Impact factors such as Porter’s five forces analysis have also been explained in the market overview section of the report, in order to give a thorough analysis of overall competitive scenario in global managed security services market. The report includes segmentation of managed security services by industry vertical, applications, mode of delivery, and geography. Different industry using managed security services includes government utilities, banking, financial services and insurance, manufacturing, telecom and IT retail, healthcare and others (education, research and development, and hospitality). The market revenue and forecast for each industry has been provided for the period 2011-2019 in terms of USD million, along with the CAGR for the forecast period 2013 to 2019. Managed security has widespread applications across different industry verticals. Some of the applications of managed security services include network security, access control, business continuity, compliance, confidentiality, risk assessment among others. A detailed market analysis and forecast for these types of applications has been provided in the study, in terms of market revenue in USD million for the period 2011 to 2019. The market revenue has been forecast for the period 2013 to 2019, considering 2012 as the base year. Different mode of delivery used in managed security services includes customer premises equipment (CPE) based, hosted or clod based and hybrid. In terms of geographical distribution, the global managed security services market has been classified into four regions namely, North America, Europe, Asia-Pacific and Rest of the World (RoW). This section includes market revenue (2011-2019) and forecast (2013-2019) for end-use industry and size of enterprise in each regional market, in terms of USD million. The study further offers recommendations and highlights of the market, which would be useful for the present and new market players to sustain and grow in the global managed security services. The report concludes with the company profile sections which include key information about the major players in the market. Some of the key players profiled in this report include International Business Machines Corporation (IBM), AT&T Inc., Trustwave Holdings, Inc., Dell SecureWorks, Inc., Fujitsu Ltd., Symantec Corporation, Hewlett-Packard Company (HP), and EMC Corporation, among others. This study includes the strategies adopted by these key players to sustain competition. Recent developments by the companies and barriers of the market will help emerging players design their strategies in an effective manner. The study is expected to help key players of the managed security services in formulating and developing their strategies.